On my wish list to make for years: homemade granola. The last time I tried making granola at home was with a toaster oven. We were living in a two-room apartment in Vietnam at that time. And, like when I tried to bake cookies, it was tricky to avoid burning the precious oats in such a tiny hot appliance. So I stopped attempting to bake granola. But I've longed to try again. 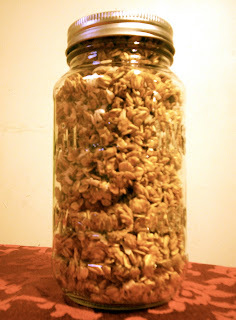 And after perusing various simple recipes, I settled on a recipe for pumpkin granola as my starting point. Since I can't help but tweak most recipes I encounter, I decided to add coconut to my version. Because from our time in Vietnam I also recall that pumpkin and coconut go very well together. 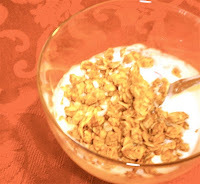 Try this granola and I think you will concur. Combine dry ingredients except for brown sugar, coconut and nuts, if using. In a separate bowl, blend together brown sugar, pumpkin, applesauce, maple syrup, and vanilla. Add wet mixture to dry mixture, stirring until oats are evenly coated. Spread granola out on a large parchment-lined baking tray. Bake for 20 minutes at 325 degrees F (160 C). Stir granola and add in coconut. Bake for 20 minutes more. Remove from oven and allow to cool completely. Add nuts if desired. If you aren't up for making granola yet, I highly recommend you take any leftover pie (such as pumpkin or pecan) lurking in your fridge and stir it into warm oatmeal. It's a truly yummy flavor combination too! Which would you rather eat on a chilly morning--granola or oatmeal? This idea is linked to Just Something I Whipped Up and Anti-Procrastination Tuesday. I am so excited to try this! We love our homemade granola, but I think this sounds so yummy!!! I'm going to surprise my hubby with it:) I'm so glad you linked to this. You have so many little treasures on your blog!